Stressless Liberty Sofa Sectional - Save time and money at The Unwind Company. The Stressless Liberty arrived on the scene in 2013! It brought with it a new style and a stronger focus on comfort than ever before. The ultra-thick padding receives your body and allows you to sink ever so lightly into the cushioning. This lets your muscles and body relax because the engineers at Ekornes designed the furniture to support you naturally. The smooth, flat surfaces of this model allow you to lay across the seats, almost seamlessly. This is new to Ekornes' designs. This is a more traditional feature that allows you to lay across the seats from armrest to armrest. Take a nap, catch a movie, or snuggle with someone special. Stressless by Ekornes is one of the most famous comfort furniture brands worldwide, and is manufactured in Norway. Stressless sofas have been manufactured for nearly 20 years and Ekornes is constantly working on improving every detail of the Ekornes Sofa and Stressless Furniture line. Take the Comfort test at the Unwind Back & Body Store and experience the difference a sofa likes these makes. Are you looking for matching, coordinated styles between Stressless Recliners and Ekornes Stressless Sofas? Most customers want their furniture coordinated to enhance a particular style and feel of their home. In the past, this has been difficult to accomplish without the help of a seasoned interior designer or other professional. The Stressless furniture line by Ekornes offers collections in a number of matching styles, that allow you to arrange your living area to suit your style and needs- the design and coordination has already been taken care of. Stressless by Ekornes combines the very best comfort with perfect style to match any decor. We always have multiple Shipping options available! Choose the White Glove option if you would like your Stressless Sofa brought into your home, set up where you want it, and to have our delivery teams take away all of the packaging. This is truly a frustration free experience. Ekornes loveseats and Stressless Recliners offer four types of leather and a number of fabrics to choose from, in a multitude of colors (see below). 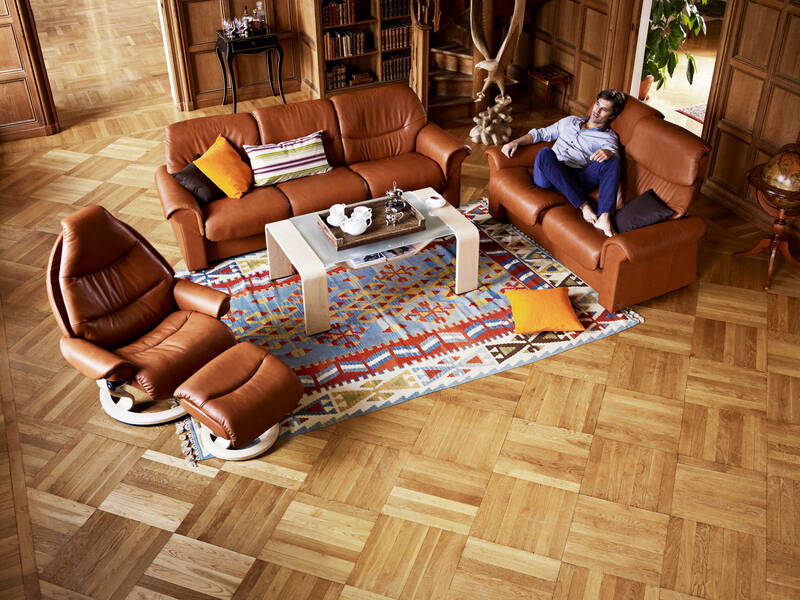 The Stressless base is made from European beech wood, and comes in a range of different finishes. You can experience quite a few leather and wood combinations at the Unwind Video Library. Click here to check out our YouTube Channel: [The Unwind Company @ YouTube]. A picture is worth a thousand words, and a video is even more valuable. It allows us to focus on the individual furniture pieces, "up-close and personal." While we find color charts handy, nothing replaces being able to see the actual leather, fabrics and wood stains as they appear on your Stressless recliner or Ekornes Sofa. All Fabrics available for Ekornes furniture. If you would like to learn more details about each fabric individually, check out our Ekornes Fabric Page. Or call 888-486-9463 to speak to our knowledgeable Customer Support Team Members. They can give you a personalized description of each of these fabrics. We invite you to grab a book, kick-up your feet and sit in the Liberty Stressless Sectional for a while- You'll be glad you did- we guarantee it! It is no wonder that Stressless Liberty Sofas are Exclusively Endorsed by the American Chiropractic Association (the ACA). Come visit the Unwind Back & Body Store to experience the Stressless Liberty Sofa for yourself. If you have already decided and are ready to purchase, simply click the "Add To Cart" button below after selecting the available options. We offer many full-service delivery options. The best part of our extensive delivery choices (aside from the great service) is that we do our best to keep the cost down for our customers. A stress-free shopping experience has been our #1 goal since 1997! We will ship your chair fully-assembled and fast in the United States (and most of North America). Please review our return policy prior to ordering or call 888-486-9463 for personal assistance. You may also email stressless@unwind.com anytime- 24 hours, 7 days a week. Product Dimensions: W: 99.75" H: 41" D: 125"